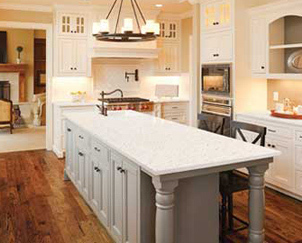 We are expert fabricators of custom stone including Granite, Marble, Quartz, Quartzite. We are able to offer the Best Competitive Pricing installed because we have our own direct onsite factory and indoor slab yard. Select your Material and Color from our on hand inventory or one of our nearest vendors carrying over 500 colors to choose from. Have a sketch ready for an estimate of the amount of material needed for your project. 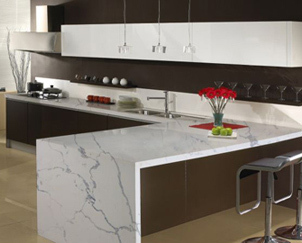 Pay a Deposit to hold the slab you have chosen and schedule our professional templators come out to your location to create a custom template of your counter space. After the templating is complete, we contact you to go over exactly how much material is need and we will adjust the price. We will require half down of the remaining balance due to start the job for you. Expect 5-15 days turnaround to completion. 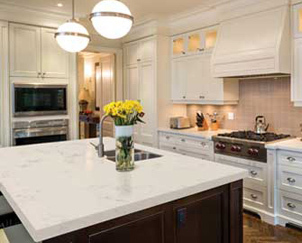 Fuda Tile is committed to providing impeccable service to make any project a memorable one.